Ichiko Bento, (Ichiko – Japanese for ‘first child’, and Bento – a traditional distinctively packed meal) is a new monthly subscription box which is offered as either ‘Classic’ 5 items, or ‘Deluxe’ 5-7 item versions, and comprises of Korean, Japanese or Taiwanese beauty products, fashion, and lifestyle accessories. The deluxe option also allows the subscriber to choose one full-sized Asian beauty skincare star item each month, and has more higher value lifestyle items, with a £3.99 shipping charge for either box. I chose a Classic subscription, which was delivered in a sturdy medium-sized box, with some items loose, and several mask items wrapped in tissue and wood shavings. 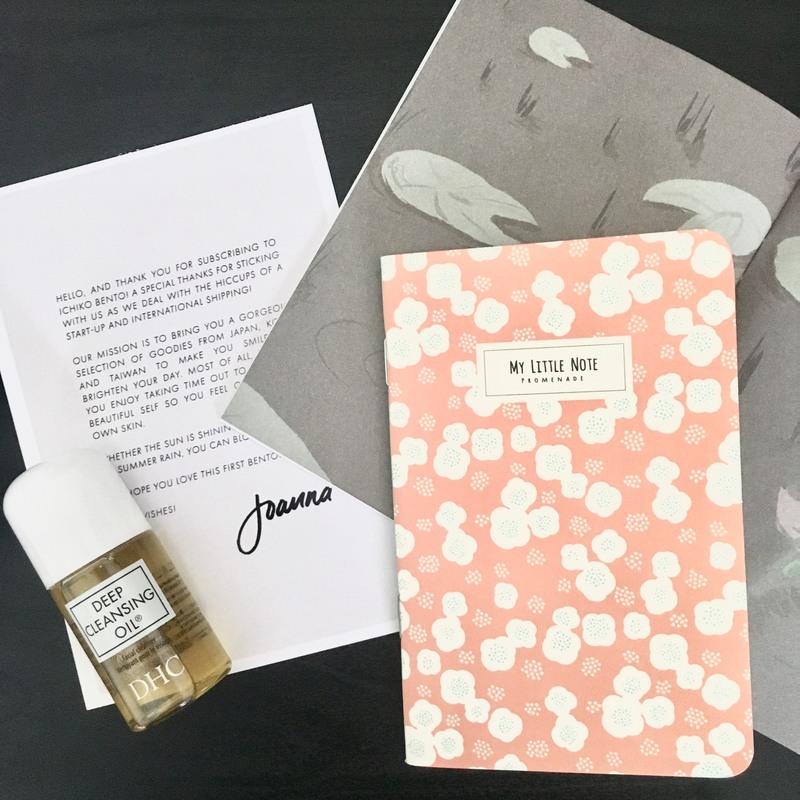 A note from the founder, Joanna, thanked subscribers for bearing with the delays and introduced the first volume ‘Bloom’. 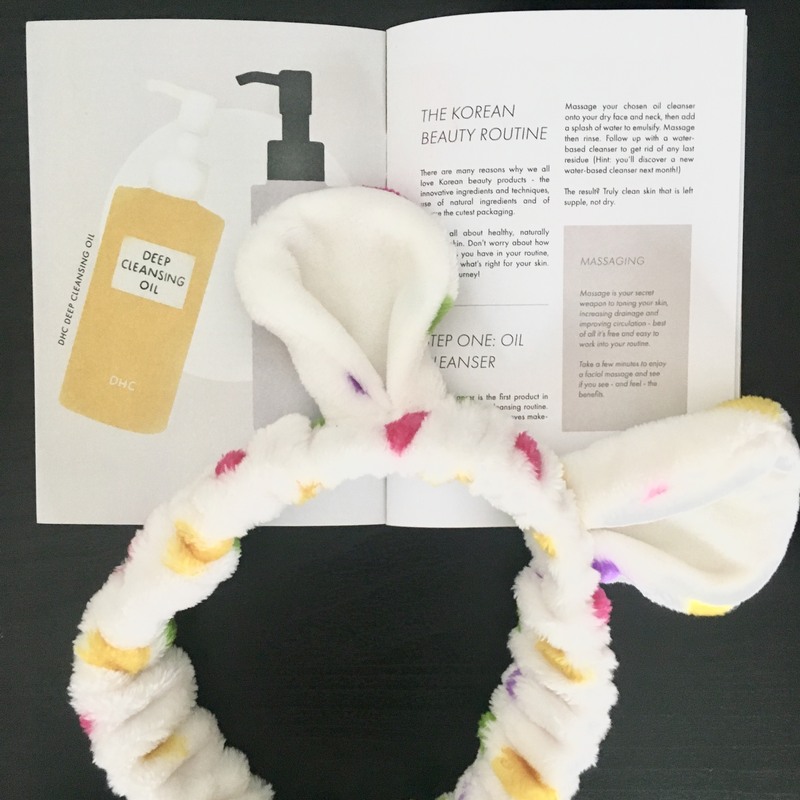 A pretty illustrated leaflet discusses the first step in the Korean beauty routine, and describes how to use each product, which is particularly useful as the product packaging are mainly written in their native languages. The mini notebook is lined on the inside and is a handy size to slip into a handbag. The DHC cleanser is a useful sample travel size of a classic Japanese beauty bestseller based on olive oil. I’m a fan of their face scrubs and mild soap so it will be interesting to try this oil cleanser. The towelling headband is soft and comfortable, I’m sure it will be useful while using the masks and DHC cleanser. New box launches are usually a flurry of excitement and expectation, drawing those who are curious enough to take a risk on a concept and a few teasers, with perhaps a founder discount offered. Instagram teasers and surveys led to much eager anticipation, but Ichiko Bento’s planned June launch was unfortunately postponed several times to delivery in July due to issues with suppliers. The first delay drew general acceptance, but further delays led to disappointment, concern and disgruntlement from some founder subscribers. 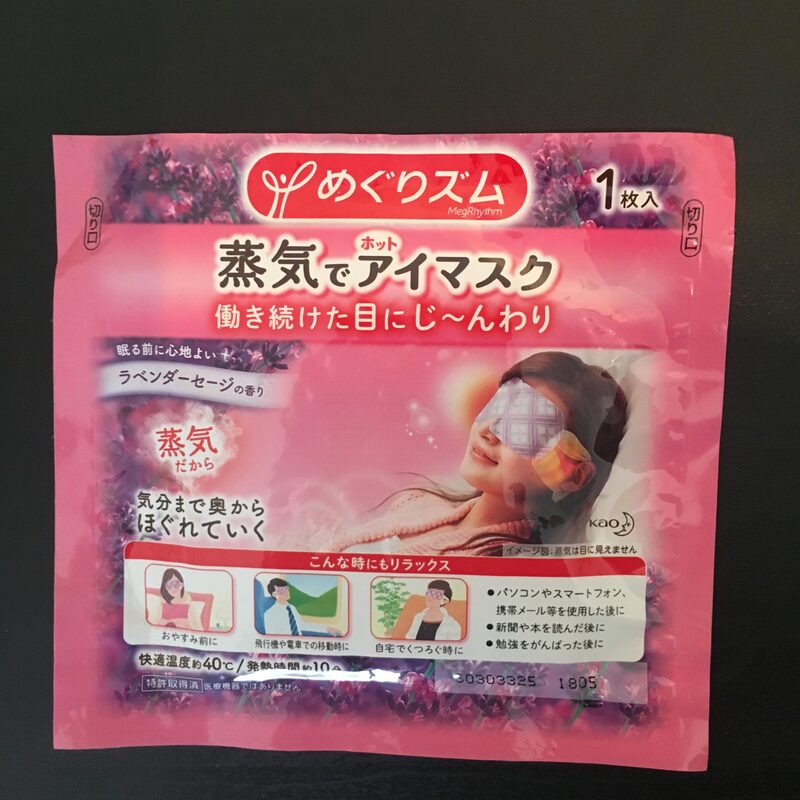 This eye mask heats to 40C to promote relaxation. On first impressions, the selection of items is half made up of masks—4 out of 8 items, making for a uniform flat presentation when combined with the headband and notebook. The exception is the DHC deep cleansing oil, which I am excited to try given its cult following, but loses some of the wow factor as it is a mini rather than full product. Ichiko Bento has released a message on their site saying that all July subscribers will be sent the PeriPera’s lip tint, which is missing from this month’s box due to problems with their UK supplier so this will be sent separately. The highest value item included is the Miirushop headband at £6.11. 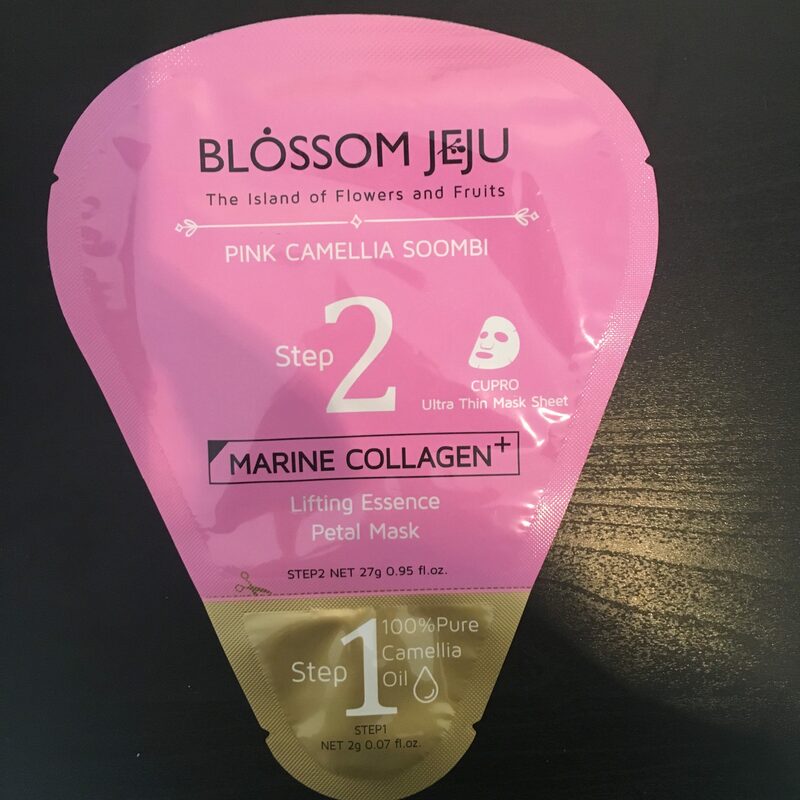 The lined mini notebook and headband complement the beauty items well but do not make up for the fact that the Bloom edition is primarily a curation of face masks, which is not really a well-rounded introduction to Asian beauty. I will be intrigued to try the different masks but this box may disappoint those who are not fans of sheet masks or are already familiar with the different types of sheet masks available. Ichiko Bento state that they aim to give their customers quality over quantity, so I am looking forward to seeing if these products really deliver. Although I will use all the items in my box, and the presentation was simple but neat, I can’t help feeling that Ichiko Bento has missed its mark finding a unique selling point. Asian products are loved for their beautiful and cute styling, and there are competing boxes which ship from the US including Yume Twins Box, Kawaii Box, Bomi Box, and Tokyo Treat. With a name like Bento, there was a missed opportunity to play with the box’s design and delight the customer for example by mimicking its namesake lacquer Bento box. At the very least with a box containing mainly flat items, a large letter sized box might have sufficed and reduced postage costs. Many customers would also have been drawn to buying from a UK company, to avoid potential customs fees. However, the delay in shipping the goods to the customer, albeit due to problems with fulfillment from Asian suppliers may make subscribers wary of subscribing. It is becoming increasingly difficult to compete in the age of next day delivery, eBay bringing Asian beauty products directly to the customer, and bargain TK Maxx mask finds. 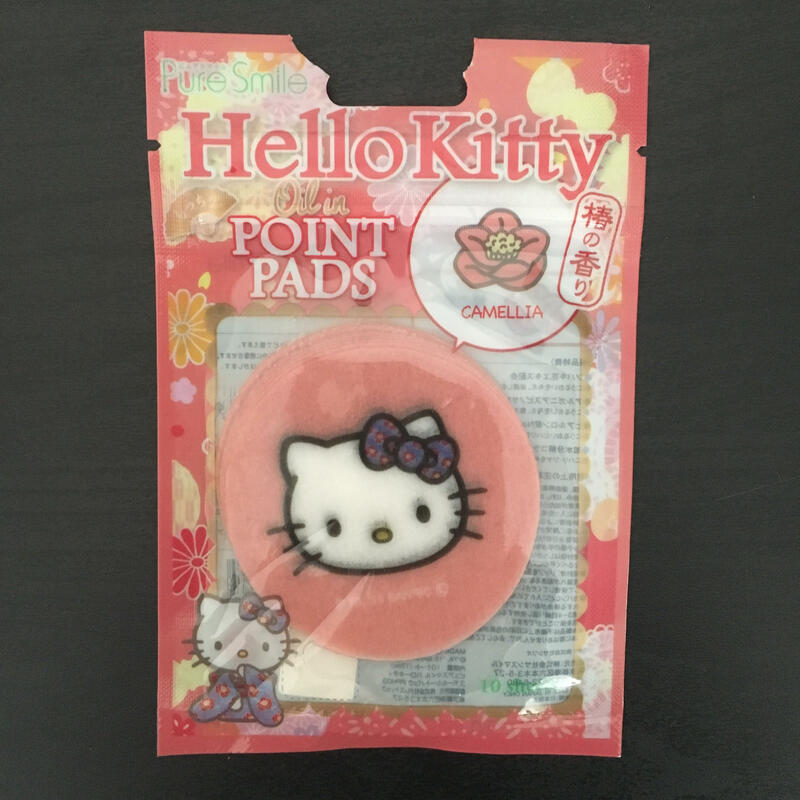 Ichiko Bento would be a subscription to consider for those who feel they need an introductory guide to Asian beauty products and a dabble in cute ‘kawaii’ lifestyle products. Looking at the pricing breakdown it offers fair retail value for money, this is not a box of bargains as it seems you are paying for curation here. Unfortunately for Joanna and her team this has been a decidedly difficult first child, but hopefully with lessons learnt with the launch box its future siblings will appear more promptly in following months and bring new variety in Asian delights.